In November I wrote about a new crowdfunded project: The Free Firearm Sound Library. Well, that project completed recently. This weekend the team delivered the first batch of sound effects. How to add extra metadata to the source files. How to rename the raw files with longer, descriptive names. Thinking about starting your own sound library? The tips in this post share what happens to a sound library after publishing, and what helps fans. I wrote last year that Kickstarter has great potential for creating sound libraries. 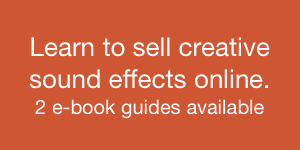 It skirts the problems with packaged sound fx libraries, and à la carte websites. The Free Firearm Sound Effects Library is a good example of the potential of Kickstarter sound collections. It raised over $7,000 in one month, and produced over 6 gigabytes of sound files in 724 clips. More processed sound files are forthcoming. Congratulations to the crew for completing such an ambitious project. Missed the Kickstarter campaign? Fear not. 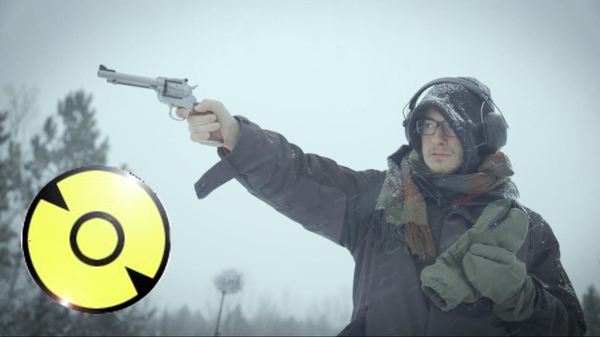 The folks at the Still North Media are offering the gun sound effects library free of charge to everyone. It’s served under a Creative Commons No Rights Reserved license, so you’re welcome to download and use it as you like. The crew delivered a complete project of tricky sound effects quickly. In this post I’ll explain how to download the collection, since it requires some attention. I’ll also show a way to build upon the crew’s metadata with additional metadata text and enhanced file names. These steps are a bit involved, so set some time aside. The instructions also require Soundminer. Update: as of yesterday, the team has provided a far simpler downloading process than what was previously described here. Below are revised instructions. 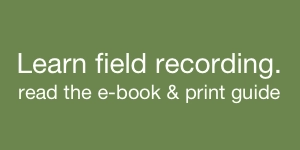 Visit the Firearm Sound Library page. Click the “Raw Effects” image. This will take you to MediaFire, a file hosting service. Check the database, and the “Raw Master Tracks” archive, then click “Download” above. MediaFire will take you through a number of pages, and ReCaptcha verification. At the end of it, click the final green “Download (3.07 GB)” button to begin downloading to your computer. Double-click the downloaded ZIP file after it has completed downloading. 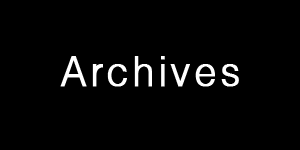 The ZIP archive will open, revealing the sound effects inside. The library arrives with a few Soundminer metadata fields filled: Description and Category. More metadata is always better! It helps us find and decide between clips. I took it upon myself to fill out more metadata fields. Designer, Composer (for iTunes export), Publisher, Manufacturer, Notes, Version, Library Name. SubCategory by gun type: pistol, rifle, machine gun, etc. An improved Description with spelling mistakes corrected, Title Case applied, and spaces trimmed. The names are adjusted to enhance organization. How? That’s good. However, it sorts all models in one batch. I renamed them so the guns sort by type, then calibre, then model. Why? Well, that ensures the handguns, the pistols, and the calibre are sorted together. That helps choose effects when using them in Pro Tools. Not a fan of this method? No problem. I’ve offered the original metadata below, too. I’ve included an image you can apply to the collection, XLS, and Numbers text listings. Soundminer has the ability to add all this metadata in one swift action. No need to type in columns of text. To do so, it imports metadata from a text file. 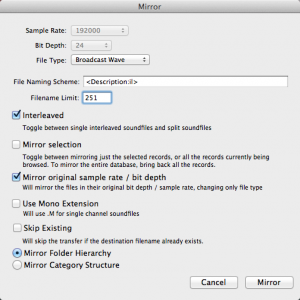 Soundminer Metadata Import File – Airborne Sound Version. 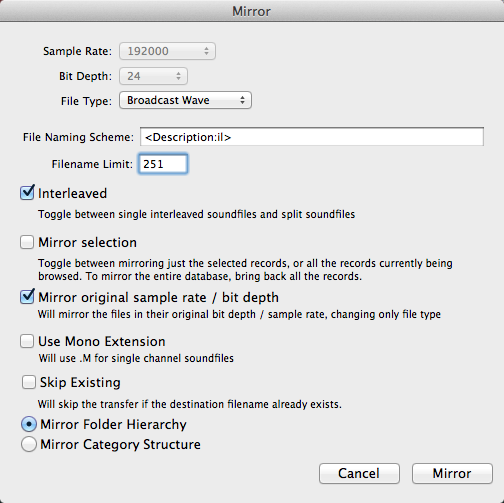 Soundminer Metadata Import File – Original Version. Prefer the Airborne Sound naming scheme I described above? Choose 1. Want to use the original names? Use number 2. And finally, here are supplemental spreadsheets and images. AudioFinder uses far fewer metadata fields. I fit what I could. AudioFinder doesn’t have a Description field. It appears to base its main info off the Filename field, which, in our case, hasn’t been renamed yet. So, an import file without a good file name isn’t too helpful. The steps in the rest of the article apply to Soundminer, so ignore those when working with AudioFinder. I don’t have AudioFinder, so this import file is untested. I used their posted import format, but can’t confirm success. Try it with caution, and only after backing up your library first. I’d appreciate feedback. 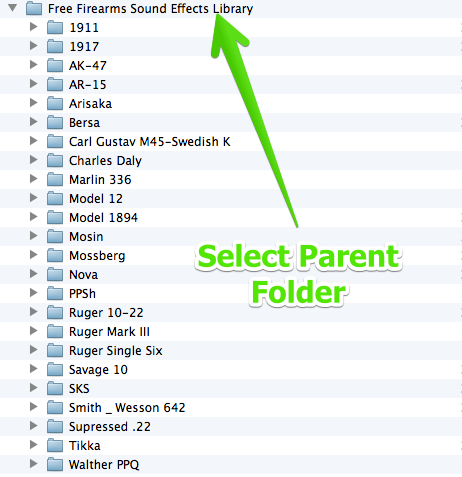 I’ll explain how to apply the metadata file to the Firearm Sound Library in Soundminer. First, though, back up your sound library. Yes, make a copy of the entire library. That way, if there is an error, you can roll back to the original file names instead of downloading the entire library again. Also note, the import files only work with the original names (as they were when downloaded from Google Drive). If you’ve changed the file names, either change them back, or download the library again. Create a new, blank database (menu item Database/Create a New Database). Optional: Select all sounds (command-A), right click in the field list, and choose “Assign Artwork to Selection.” Soundminer will prompt you for an image file. If you want, select the image I included in the bonus pack. Select all sounds, right-click in the field list, and choose “Embed Browsed Records.” That will apply the metadata to your sound library. That description is applied to both files A_33.wav and A_34.wav. Since no two files can share the same name in the Mac Finder, this will cause Soundminer to sulk and not rename the conflicting files. This is one important reason why a sound library benefits from unique names. We could work around this by adding a “1”, “2”, and so on to duplicate descriptions in the metadata Description field. There are over 200 duplicates, so that’s too much work. Instead, we’ll use Soundminer’s Mirror function. That will make an exact copy of the library, but with the new names. While this takes up twice the space (temporarily), it’s actually a good idea for now. It ensures that you don’t overwrite your originals with mistakes. It will also rename duplicate filenames properly, and strip out illegal characters (&, /, . and so on) during conversion. Mirroring isn’t always the best way to rename source files, but in this case, it’s the simplest to explain for our purposes. Remember, be safe: back up your library. Display all gun sounds (command-J). Ensure there are 724 of them, and all have metadata. Select the menu item Database/Mirror. A settings window will appear. Here are my settings. 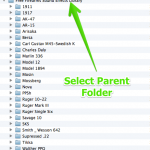 These ensure that the new “mirrored” copy will be identical to the original, tucked in matching, nested folders. The only difference? It will give the library longer, rich names. “File Naming Scheme” is “<Description:il>”. That chooses the Description field for the filename. The “:il” strips out all illegal characters. Soundminer will display a new window. Choose a destination for the new copy of the sound library. Ensure this is not inside your existing library. It should be somewhere far from the original copy of the sound library. Check the new “mirrored” library. Drag those files into a new Soundminer database. Do they have the longer file names? Is all metadata present? If so, delete the original copy with the old names. Just ensure you trash the correct library: the folders look similar, after all. Note that Soundminer sensed duplicate names. Instead of creating a conflict, it just tacked a “_1” after any duplicates, leaving the rest of the metadata intact. Duplicate file name problem solved! Note: Soundminer 4.5 beta users should use 4.3. The new beta 4.5 introduces errors. It’s complex. Set aside a good chunk of time to get all tasks done. Compartmentalize your tasks. Proceed through each step slowly and methodically. Avoid multi-tasking. It will tangle your workflow. Make back ups. If you make errors, you can roll back to your previous copy. Do you have questions? Is there a step that requires more detail? Spot a quirk? Please feel free to contact me. 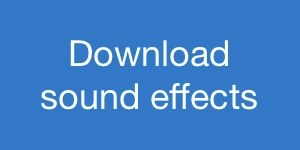 And thank you again to the publishers of the Free Firearm Sound Effects Library. Main article image courtesy of the publishers.